Sake sales are on their way up worldwide and as the global taste for the Japanese fermented wine increases, so does the breadth of choice. From elegant and smooth to rough and ready, there are a lot of sakes out there, but how confident are we when it comes to serving them correctly? While temperature plays a key role in optimising the aromas of your chosen tipple a great starting point to enjoying your sake at its optimum is having a basic knowledge about which serving cup is best to use. Most of us are probably familiar with using the small white ceramic ochoko, as preferred in many restaurants for serving hot and cold sake. But, as with wine, there is actually a myriad of choice in serving cups. 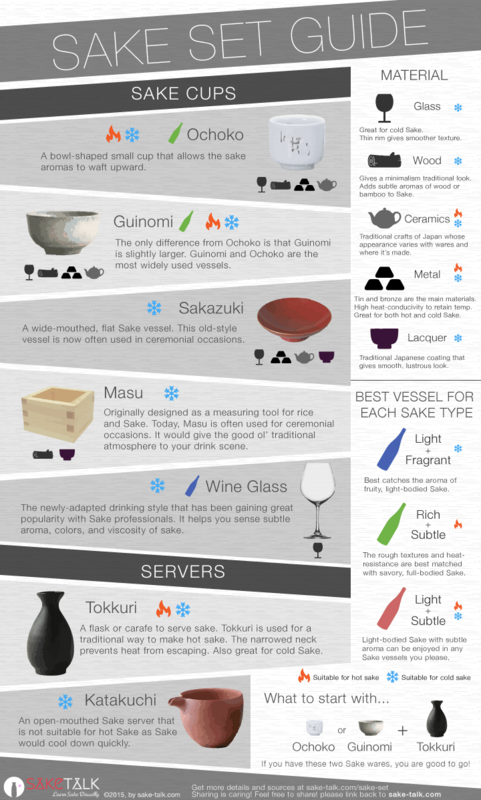 This infographic from Sake Talk is the perfect introductory guide to how to serve the Japanese drink and outlines a few of the fundamentals. In fact, cup volume, material, shape and the mouth width of the vessel all play a part in altering or retaining the heat and aromas of sake. Learn how to make sake at home.